What is a Filarial infection? The cutaneous group contains Loa loa, Onchocerca volvulus and Mansonella streptocerca, causing respectively Loiasis (African eye worm), Onchocerciasis(River blindness) and Streptocerciasis or Mansonellosis. Lymphatic filariasis (Elephantiasis) is caused by Wuchereria bancrofti, Brugia malayi and Brugia timori. How common is a Filarial infection? Is a Filarial infection contagious? What are the signs and symptoms of Filarial infection? 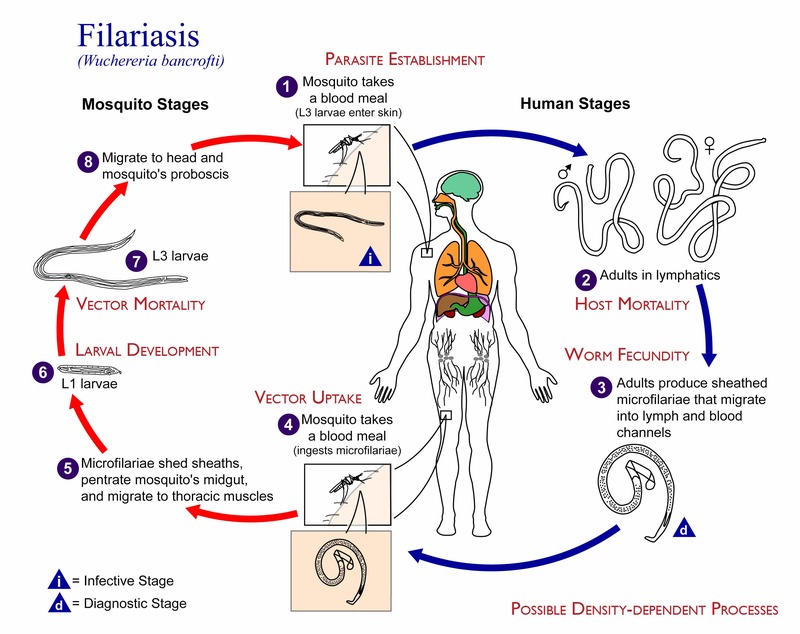 How is the diagnosis of Filarial infection in humans made? What is the treatment for a Filarial infection? Are there complications of Filarial infection in humans? What are the preventive measure for a Filarial infection? There are no vaccines available to prevent lymphatic filariasis, mansonellosis, loiasis and onchocerciasis. Centers for Disease Control and Prevention. Accessed online 27th September 2017. Weblink: Centers for Disease Control and Prevention. Accessed online 27th September 2017. Centers for Disease Control and Prevention. Accessed online 27th September 2017. Weblink: https://www.cdc.gov/dpdx/mansonellosis/index.html . Tab: parasite biology.